Would make a great gift for Christmas. 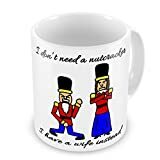 I Don’t Need A Nutcracker Christmas Funny Novelty Gift Mug. The design is on both sides of the mug. Would make a great gift for Christmas. Approx. Measurements: 9.5cm x 8cm. Comes within a box.